Adrian Booth made one visit to Worcester Locomotive Sheds during the steam era. 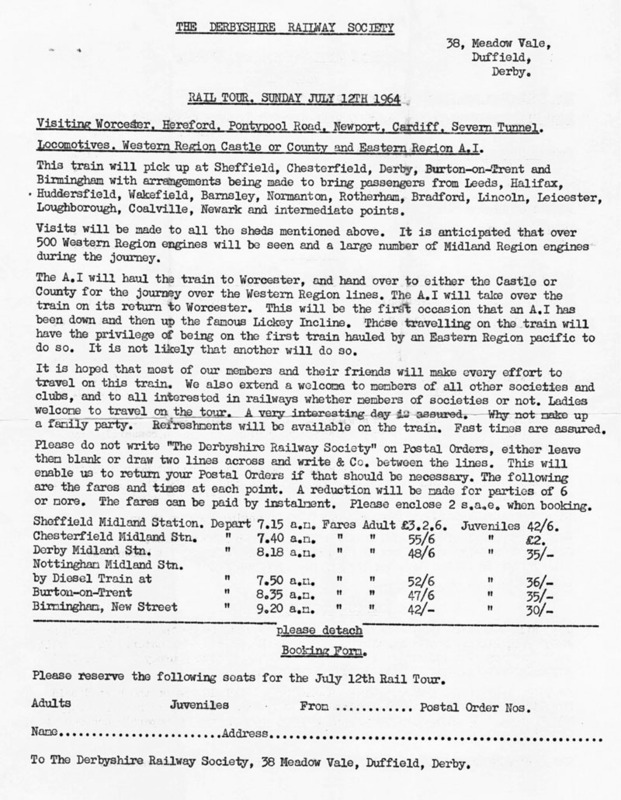 This visit was on 12th July 1964 on the occasion of a Derbyshire Railway Society railtour from Sheffield. Adrian's recollection of this railtour and his photogrpahs taken at Worcester are on this page. "Steam on the left!' In response to the traditional gricer's cry our carriage tilted slightly as the entire occupants sprung to the left and placed collective noses hard against the window glass. Seconds later our train rolled past Bromsgrove-allocated 0-6-0 pannier tank No.9493. It was a historic moment for me as, at last, I could underline my very first ex-GWR locomotive in my 'combined volume' - the yellow issue with Southern unit 7014 on the cover and for which, incidentally, it had taken me quite a while to save up the 11s 6d cover price. "It was 12 July 1964 and my pal and I were aboard a special train taking enthusiasts from Sheffield to South Wales. I was then a snotty nosed thirteen year old kid and had been train-spotting for about three years, based at my home in Rotherham, South Yorkshire. Hitherto, all my outings had been to places such as Sheffield, Leeds, Manchester and Derby, and consequently my cops were all former LMSR and LNER engines. So when the Derbyshire Railway Society advertised a special train to visit five ex-GWR sheds, including 85A Worcester, it was an opportunity not to be missed. The thought of all those exotic 'Castles' was just too enticing, and several weeks pocket money, plus the proceeds from my paper round, were duly expended on purchasing a ticket for the trip. "Preparation for the trip was intense. My Dad, together with his ancient black Austin 10 car, was booked to take my pal and I from Rotherham to Sheffield early on the Sunday morning. My mother was asked to prepare some sandwiches for me. A pristine notebook was bought. And I had to learn the rudiments of photography. 1964 was long before the age of cheap automatic cameras, and also before I had a proper income; consequently I had never taken a photograph in my life. The lure of ex-GWR steam, however, led me to nag my Dad into promising to lend me his camera. It was a Zeiss Ikon, complete with fold-out bellows, a selection of shutter speeds, and things called 'f-stops'. My Dad lectured me on the techniques of photography, but it was a new science and seemed very confusing. The solution was found by my Dad loading a single 8-exposure 120 roll film into the camera; the shutter speed was set at 1/250th second; focusing was set at near-infinity; and three f-stops were written into the back of my notebook, to be variously used depending on if the weather was sunny, bright-ish, or dull/rainy. "The great day eventually dawned. With strict instructions to take good care of the camera ringing in my ears, the Zeiss was packed into my duffel bag (together with enough sandwiches to feed the Eighth Army) and so it was that I set out for Worcester and South Wales with just eight photographs to last me for a whole day's GWR bashing! "Our special train was pulled by A1 pacific No.60114 'W.P.Allen' and it hauled us briskly down the ex-Midland main line. 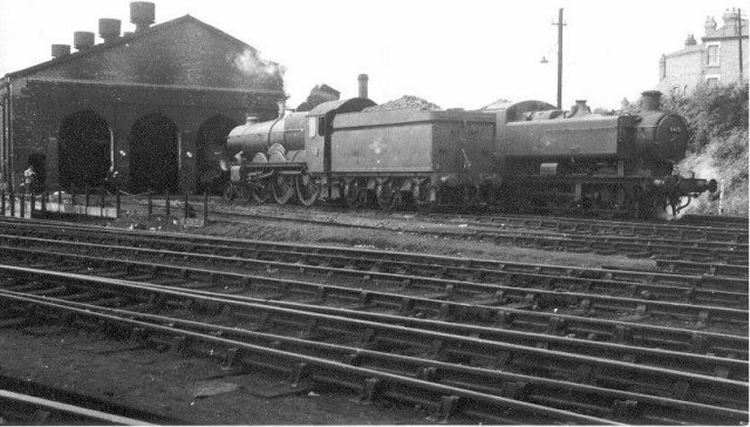 We noted 'Jinty' tanks Nos.47543 and 47611 on the roofless Hasland shed, while No.45667 'Jellicoe' and J94 saddle tank No.68013 were notable amongst many engines seen at Derby. The above-mentioned sighting of No.9493 took place south of Birmingham, and was soon followed by Nos.2222 and 8400, plus another seven seen over the next half an hour or so. My ex-GWR underlinings were starting to grow. "As our train drew to a stop, on time, in Worcester station, we noted Castle class No.5054 'Earl of Ducie' which was standing on the centre road of the station, waiting to haul us on our tour around the east end of South Wales. The 'EARL' was Worcester shed's favourite railtour engine of the time, having inherited the role from No.7023 which had been transferred to Oxley. In fact No.5054 had been used on a railtour to Bridgend only three days earlier. The participants of our trip all piled out of our carriages and waited for the organiser's okay to go across to Worcester shed; this was duly given and, in a display which would give present day Health & Safety executives apoplexy, we literally swarmed across the tracks to the shed and works. 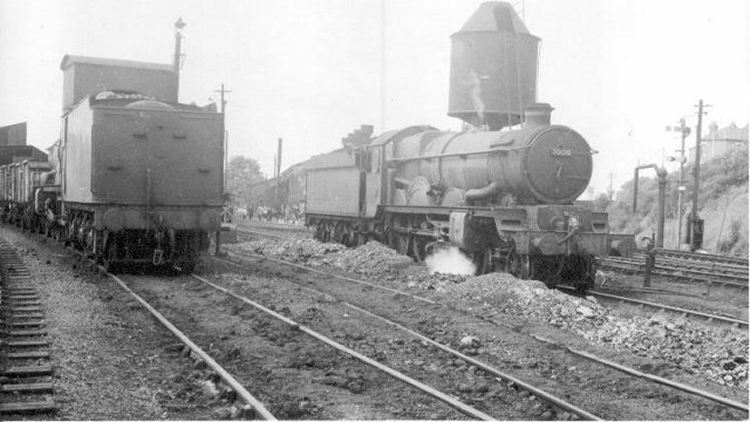 36 steam locos and one diesel (No.D7026) were seen (all copped by me), with No.7013 'Bristol Castle', by then allocated to Tyseley, being found outside the works. "The subject of the first photograph I ever took in my life was No.7025 'Sudeley Castle'. Worcester based 'Castle' class locomotive 4-6-0 No.7025 'Sudeley Castle' in steam standing outside the front of the boiler washout shed (or Goods Shed) at Worcester. No.7025 was built in 1962 and was based at Worcester from September 1962 until withdrawn in September 1964. No.8415 (on the right) was one of the '9400' class of locomotives designed by Hawksworth and introduced from 1947. No.8415 was built in 1950 and was withdrawn from Worcester in 1965. "I struggled with the pop-up viewfinder (which gave a very cloudy image), selected the appropriate f-stop from the choices written in the back of my notebook, and fired away. Looking at the negative 37 years later I wonder if my intention at the time was actually to take a portrait of No.7025 - but what I achieved was more of a shed view, with pannier tank No.8415 prominent, and No.8104 poking out from the murky right-hand road. I recall being not at all sure if I had operated the camera properly, but I fiddled with the wind-on arm, wondered if I had wound-on properly (if at all), and then went in search of my second picture. 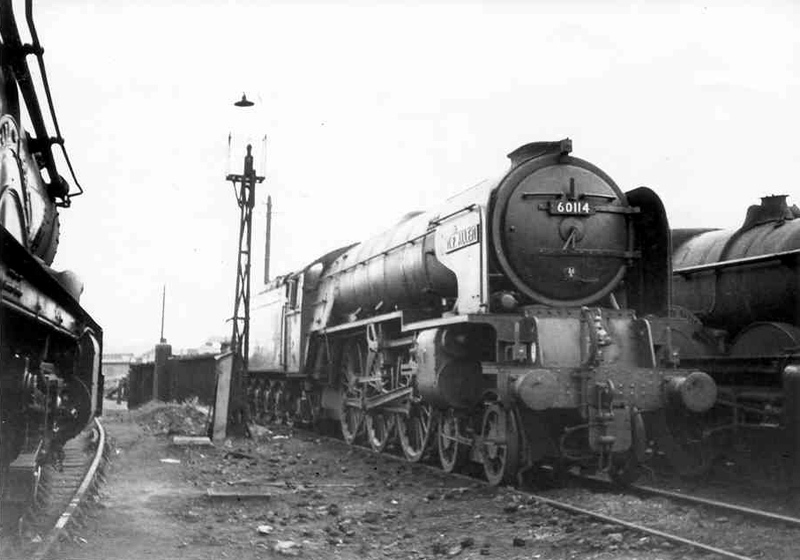 I was captivated by the Castle class, and took No.7005 'Sir Edward Elgar', a Worcester engine all its life. "Round the back of the shed was pannier tank No.1661. This engine was fitted with a massive spark arrestor chimney due to its regular duty on the famous 'vinegar works branch' in the city. I recall lining up a shot of this loco but, at the last second, I lowered my camera. 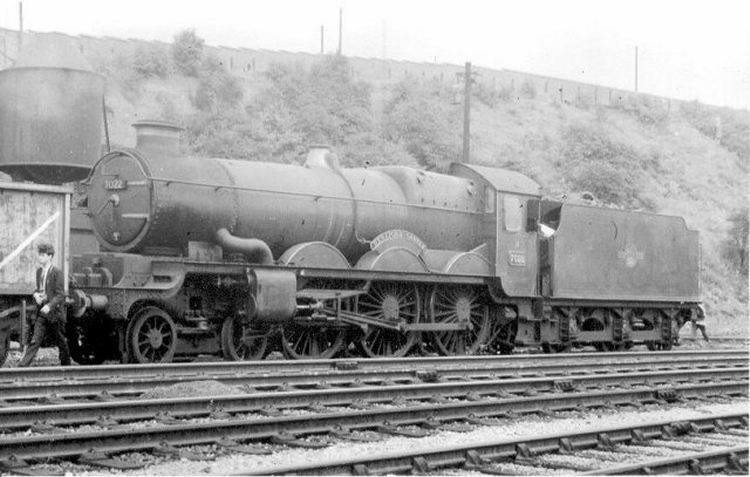 Who can explain why my thirteen year old brain rejected this gem and, instead, guided me back out into the shed yard where No.7022 'Hereford Castle' was photographed? At least my third Castle was a double-chimney variant. 'Castle' class 4-6-0 No.7022 'Hereford Castle' of Worcester was one of the last of its class in service ending its days at Gloucester in June 1965. "At the station we watched as 'W.P.Allen' backed down towards the shed, where it was to be serviced, coaled and watered, and have a few hours rest before pulling our returning tour back to Sheffield. Meanwhile, 'Earl of Ducie' coupled on to our train. Miraculously everyone was back from the shed and so our train pulled out of Worcester, on schedule, and headed off to Hereford, Pontypool Road, Cardiff East Dock, and Severn Tunnel Junction sheds. After some fabulous shed-bashing, 'Earl of Ducie' pulled us back to Worcester and, upon arrival, I stood on the platform to watch, sadly, as our Castle puffed off to the shed. It was a poignant farewell to a fine engine. We were already running well behind schedule, but there was then a further delay. Our carriages stood at the platform, but with no loco. Where was our A1? Minutes ticked by and nobody seemed to know what was happening, other than that our departure was getting later and later. Eventually Saltley-allocated Black 5 No.45263 emerged from Worcester shed and ran down into the station. But where was our A1? To our surprise the Black 5 coupled on to our train and, in the absence of any official explanation, rumours abounded as to why. Many years later, a Malvern-based friend told me what had actually happened. It seems that No.60114 been damaged when a Worcester driver, anxious to try out an A1 for the first time, drove it up the yard and managed to prang it in a violent wheel-slip. Over the next few days, the A1 was the reason for many stealthy 85A shed visits by Worcestershire gricers anxious to cop the rare visitor. No.60114 was only despatched home after lengthy repairs. This photograph which is made available here by kind permission of Dave Greenwood shows No.60114 at Worcester Sheds on 24th July 1964. "Back at the train, No.45263 made heavy weather of our packed excursion, making slow progress up the Lickey and back to Sheffield. If memory serves me correctly we rolled back into Sheffield about four hours late. It must be understood that those days were light-years before mobile-phones, and I was unable to contact my father to tell him we would be late. Thus he was forced to while away the hours in Sheffield, not knowing what was happening, until our train eventually got back. Let me just say that there was a somewhat frosty atmosphere in the Austin 10 as we chugged back to Rotherham in the early hours!" Note: Another version of this story by the same author appears in the magazine 'British Railways Illustrated, Vol.13 No.10 - July 2004'. Item from the archives of the MIAC.